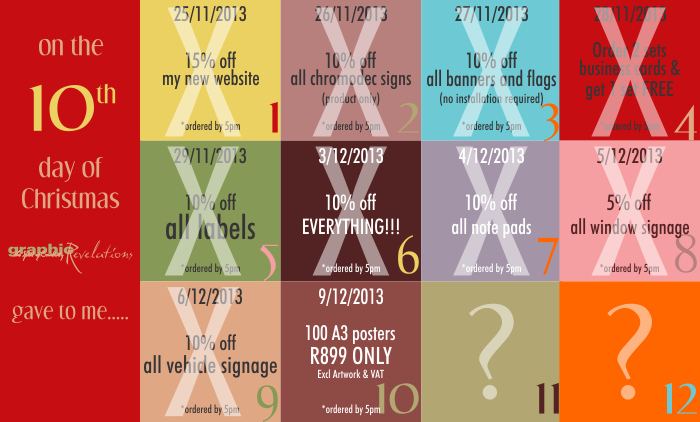 On the 10th day of Christmas Graphic Revelations gave to me…..
Pay ONLY R899 for 100 A3 gloss posters! THE SMALL PRINT: You must redeem this gift by 5PM to qualify. This gift will not be repeated. You cannot use this gift in conjunction with another promotion. Excludes artwork and VAT.